Hip No. 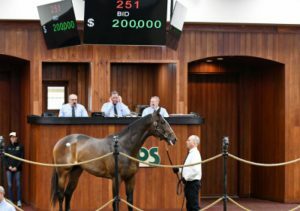 251, Golden Notion, a 3-year-old son of OBS graduate Goldencents consigned by Woodside Ranch, Agent, was sold to S B M Training and Sales, Agent, for $200,000 to top the first day of the Ocala Breeders’ Sales Company’s 2019 Winter Mixed Sale. The bay colt, who worked a half mile in :44 flat at the Under Tack Show, is out of stakes placed Angels Trace, by Bellamy Road. Hip No. 198, Noble Commander, a 4-year-old stakes winning son of Forestry consigned by Moonshadow Farm, Agent, went to Agave Racing Stable for $135,000. The bay colt, who breezed three eighths in :33 flat at the Under Tack Show is out of Indian Carlie, by Indian Charlie, a half sister to grade one winner Marley’s Freedom. He was a front running winner of the Woochopper Stakes at Fair Grounds on December 29th and has earned $143,843 to date. Hip No. 194, Grand Royale, a 3-year-old gray or roan colt by Cairo Prince, consigned by James Layden, Agent, was sold to Zach Madden for Ron Paolucci for $75,000. Out of Helluva Hangover, by Grand Slam, from the family of grade one winner Hardest Core, he turned in the Under Tack Show’s fastest three eighths, stopping the timer in :32 1/5. Hip No. 240, Change Direction, a 3-year-old son of Curlin, was purchased by Peach Tree Stables for $60,000. Consigned by Niall Brennan Stables, Agent, the dark bay or brown colt is out of Switched Up, by Pleasantly Perfect, a daughter of graded stakes winner Antoinette. Hip No. 282, Dixieincandyland, consigned by Wes Carter, Agent, was sold to Eddie Kenneally, Agent, for $60,000. The dark bay or brown 3-year-old Candy Ride (ARG) filly, who turned in three eighths in :32 4/5, is out of Dixieinyankeeland, by Dixie Union, a daughter of graded stakes placed stakes winner Descapate. For the Horses of Racing Age session, 62 horses grossed $1,204,000 compared with 57 selling for a total of $880,000 in 2018. The average was $19,419, up from $15,439 a year ago, while the median price was $8,500 compared to $9,000 last year. The buyback percentage was 17.3%; it was 9.5% in 2018. Three horses brought $75,000 to share honors topping the Consignor Preferred Section. Hip No. 28, a yearling son of Distorted Humor consigned by Select Sales, Agent, went to First Finds for $75,000. The chestnut colt is out of Inspeight of Us, by Speightstown, a half sister to grade one winner Daddy’s Lil Darling. Hip No. 70, a yearling colt by Bernardini also consigned by Select Sales, Agent, was sold for $75,000 to Calumet Farm. The bay colt is out of graded stakes winner Palanka City, by Carson City. Hip No. 148, a yearling colt by Cairo Prince consigned by Stuart Morris, Agent, went to de Meric Sales, Agent for Backstretch Farm, for $60,000. The dark bay or brown colt is out of Broad Miss, by Include, a daughter of graded stakes winner Miss Legality. For the Consignor Preferred session, 104 horses sold for a total of $1,755,100, compared with 147 horses grossing $3,452,700 in 2018. The average price was $16,876 compared with $23,488 a year ago, while the median price was $12,250, up from $10,000 last year. The buyback percentage was 28.3% it was 29.7% last year. The Winter Mixed Sale continues Wednesday at 11:00 a.m. with Hip No.’s 351 – 689 in the Open Session. Sales results are available on the OBS website, updated hourly during each session of the Winter Mixed Sale. In addition, the latest news regarding OBS graduates, sales schedules, nominations, credit requests, travel information and other news relevant to OBS consignors and customers is also available. E-mail should be addressed to obs@obssales.com.